Post your Sunday School Art, Textile lessons, ideas, activities, and resources for the Lord's Prayer. Bible lessons and ideas about the Lord's Prayer -with Art, craft, painting, construction, drawing, etc. 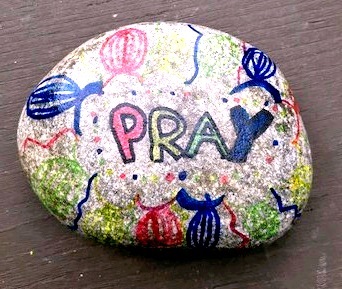 Decorate prayer rocks and children will receive a copy of "The Prayer Rock Poem." Define prayer as a means of growing a personal relationship with God: talking and listening to God – any time, any place, and about any thing. Wash the rocks and allow plenty of time for them to dry. Write in large letters, the Lord’s Prayer on a piece(s) of easel paper and post it on the wall where it can be seen. Spread the table covers over the tables. Fill water containers half full. Prepare one cup for every 2 students. Prepare paint palettes – one for every 2 students and set aside. To prepare: Shake paints and place a quarter-sized squirt of red, yellow and blue paint distributed on a paper plate. Also place a dime-sized dollop of white and of black. Hold-off on other colors for now. Have other supplies ready but set aside. Greet your students warmly, introducing yourself and any other adults. Say: This month we are learning about the Lord’s Prayer. [After the second week instead ask: What are we learning about this month?] Today we are going to make prayer rocks that will help us remember to pray. You can each decorate one rock with paint. Let’s start with prayer. Ask for any prayer requests. Ask students to say their name and then their request. [It is okay if you write these down.] Ask if anyone would like to help you say a prayer. Use the Lord’s Prayer as the ending. A prayer suggestion: “God, Thank you for teaching us how to talk to you in different ways. May we pray to you with our whole hearts, giving thanks for all of the wonderful blessings you have given to us.” (Pray for requests. End with the Lord’s Prayer.) Amen. Say: Prayer is talking and listening to God. Prayer is communicating with God. Why do we call it “the Lord’s Prayer”? Say: We call it the “Lord’s Prayer” because Jesus taught it to the disciples. Jesus and God are often called “Lord.” Let’s read in the Bible about Jesus teaching his disciples to pray. Do: As you say the next words, show the portions of the Bible that are the OT and the NT. Say: The Bible contains two Testaments or two major sections – the Old Testament and the New Testament. The New Testament includes stories about Jesus. Say: The word “Gospel” means “good news.” The first four books of the New Testament tell the story of the good news about Jesus. It is indeed good news that Jesus taught us how to pray. Do: Make sure that everyone has access to a Bible. Ask: What are the names of the four gospels? Say: Follow along as I read these passages to you. I will start with Luke. Opening the Bible in middle lands you usually in Psalms. Taking just the back half and finding middle of that, gets you to beginning of NT. Say: Jesus teaching his disciples how to pray is found in the book of Matthew and Luke in our Bible. Listen as I read to you from the Bible in the Gospels of Luke and Matthew. Ask: Have you ever heard that prayer during the worship service? Say: What we say as the Lord’s Prayer is slightly different than what I just read. We will talk some more about the Lord’s Prayer as we paint our prayer rocks. Say: Let me read to you a poem that you can take home with your prayer rock. Say: We can call these our pillow prayer rocks! It sounds like a fun way of being reminded to pray. Let’s start our art project: painting our pillow prayer rocks. You may decorate your prayer rock in whatever way that you’d like. Because paint takes time to dry, you’ll only be able to decorate one side of your rock. Do: Distribute to each child a sheet of newspaper, a piece of scrap paper, a pencil, and a paper towel. Say: I am handing out some scrap paper in case you want to doodle some ideas for what to paint on your rock. The Shepherd(s) will be coming around a writing your name on the piece of paper towel. We also have paint smocks to wear. Do: Distribute paint smocks. Show them the supplies they can use. Explain how every two students will be sharing a palette of paint. Distribute six paintbrushes with each palette. Point out how time will be saved if each brush is used for one color on the palette (less washing of brushes). Do: Distribute one rock per student. Ask them to work with their rock on the paper towel. Light pencil sketching on the rock is okay. Avoid trying to use the paintbrush to “sketch” (i.e., lifting the tip as you make short strokes). Instead, place a loaded brush on the rock and pull out gently but firmly. This gives better control. (Demonstrate this on the easel with a dry brush). To create straight lines hold the brush nearly perpendicular (“straight up and down" to the rock). Suggest testing out brush strokes on the newspaper. “Big to little.” Paint in the large areas first. Encourage creating more colors on the “palette” (the plate) by mixing colors. Add white paint to make a lighter color, black to make a darker color. If students would like other colors you may offer them. Say: While you work I am going to ask you some questions about prayer. We had described prayer as a way of communicating with God. Say: Prayer makes our relationship with God stronger! Ask: How do you get to have a close relationship with a friend – like if you have a really good friend – how did you become close friends? Say: That’s right, to become close friends you had to spend time together, you did things together including talking and listening. God really wants to have a close relationship with us! He wants very much to hear what is on our minds. Ask: Can you imagine trying to have a best friend without talking with them? Say: So prayer is communicating with God. We may not be able to call God on the telephone or send him a letter, but prayer is just as real as an email. God hears us! Do: Tell a story about a time when you felt that God heard your prayer. Ask: Can you pray when you are happy? What about when you are sad, or in trouble? What about when you are mad? Say: We can pray to God anytime and about anything! Ask: Do you suppose that there are Christians who read the Bible in name the closest town to yours? What about in name a near by state? In Canada? In South America? In Germany? In Africa? Say: If people read the Bible all over the world then they’ve heard about Jesus teaching us to pray! That is amazing isn’t it – the Lord’s Prayer is said all over the world! That really brings Christians all around the world together! Have students add detail to their work. See painting tips above. Have students share their work with the class, explaining about their choices. Say: Use your prayer rock to remind you to talk to God in prayer. Do: Read the prayer rock poem again. Say: God loves you. God would like very much to hear your prayers. Do: Hand out a copy of the prayer rock poem and (if students have not yet received one) a copy of the Lord's Prayer. hen turn back the covers and climb in your bed. And “WHACK” -- your little prayer rock will hit you in the head. Then when you are finished, just dump me on the floor. When you get up in the morning, “CLUNK”, I’ll stub your toe. Your clever little prayer rock will continue to be your aid. Because your heavenly Father cares and loves you so. He wants you to remember to talk to him, you know. Lake, Jane. “How to Paint a River Rock.” 2010. <http://www.allfreecrafts.com/nature/river-rocks.shtml>. MacQueen, Neil. “Lord’s Prayer – Lesson Outlines.” Rotation.org. 2001. Marshall, Jan. “The Lord’s Prayer Lesson Set.” Rotation.org. 2002. Welford, Lin. 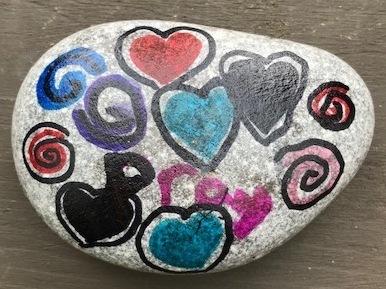 Rock Painting Fun for Everyone! Green Forest, AR: ArtStone, 2006. Worked great. I was really surprised how well the older ones enjoyed making the rocks. IMPROVEMENT MODIFICATION: We used hairspray to give sheen and "set" the colored markers we used on the rocks. 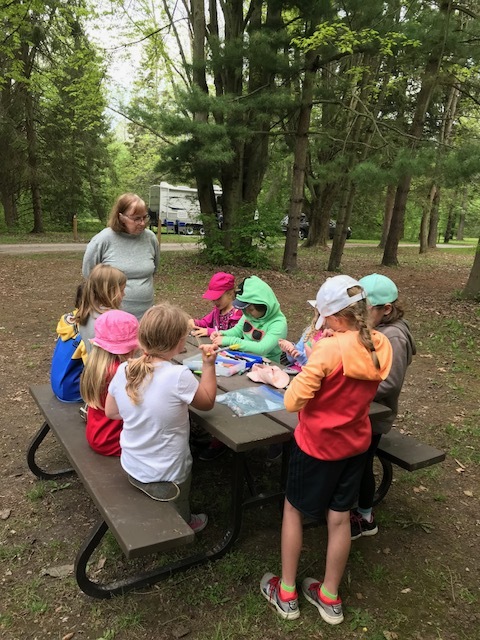 We did it at our girl's (ages 7-9) spring camp at the local provincial park in May 2018. 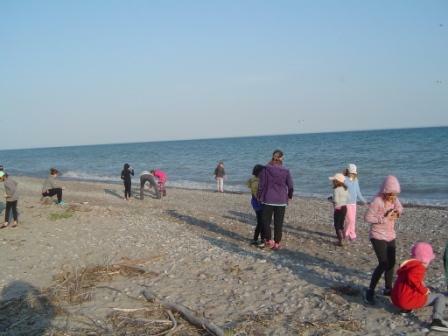 On the Friday evening we went on a scavenger hunt, the girls searched for their perfect rock at the park's lake beach. Saturday morning after breakfast we decorated them. We used permanent Sharpie markers and sealed them with Gloss Decoupage Glue (the bottle indicated it would work on most things and it did!). They decorated both sides, one around the word "Pray" and the other around their name. Only had to wait a couple of minutes for the marker art work to dry, then I went around the table and simply squeezed a few drops of glue right from the bottle directly onto their stone drawing and they used a foam brush to spread it thinly over the top and sides. A few minutes later they flipped them over and I dropped glue onto the other side and again they smoothed the drops over their rock. The marker never smeared. They glue dried really quickly. We also gave the girls a laminated mini copy of The Prayer Rock Poem and a small baggie to store them in. Here is a link to a pdf of The Prayer Rock Poem (6 per page) you can print and laminate. Copyright 2002, 2013 First United Methodist Church, Ann Arbor, MI. Permission to copy materials granted for non-commercial use provided credit is given and all cited references remain with this material. Children will each create a square for a thankful quilt. 12”x12” squares of white cotton-one for each child. Decide if you are going to do an appliqué or a patchwork-style quilt. If appliqué- you may want to hem the squares with a ¼ hem on all sides. “prayer hand” pattern (do an internet search using the term “prayer hand”. You will see examples of hand outlines with a prayer category listed on each finger. They are intended to be reminders of how to pray). NOTE: Be sure the children know the actual words to the Lord’s prayer. Often, they miss-hear them and that is a hard habit to break. Explain to the children that today they will be learning about prayer. How do you pray? Are there any special prayers that you say at your house? When do you pray? What do you pray about? Explain that Jesus had many people that followed him and listened very carefully to what he was teaching. One day, he taught the people about prayer. He told them that they didn’t need a bunch of fancy words to talk to God. They didn’t even have to have their prayers memorized. They just needed to tell God what was on their hearts. Jesus showed them what he was talking about by saying a prayer for them We call this prayer the Lord’s Prayer. Ask them if they remember hearing this prayer during our worship service? We are going to decorate white squares which will be made into a quilt to hang in the Gathering Room. Tell children they will be making squares for a quilt that will decorate the Gathering Room when it’s all done, so they should do their best work because everyone will see it. Using the “prayer hand” as an example, ask children to write a one-word response on each finger of their own, drawn hand. i.e, in response to thanks, they should ask themselves, “what do I thank God for?”, then write the answer on one of the fingers. To adapt this for non-readers, adults and/or older children can help by asking the children the questions and writing down their responses. The young children can choose which color they would like used for each response. Have each child write his/her name on the cloth, either on the palm of the hand or directly underneath the hand. Leave about ½ inch around each edge for sewing. Find a safe place for the squares to dry. Older students are going to be given the opportunity to do this, also, so once the squares are dry, they will be stored until all squares are done. Reflection: Remind children that prayer is talking to God and that God wants to hear from us all the time. We can and should talk to Him as much as we want to. If time, ask for highs and lows. End with the Lord's Prayer. We will be attaching the white squares to some fabric that has the look of stained glass. We will be hanging this in our main Gathering Room/Fellowship Area once it is complete. I adapted this lesson from something I believe I got on this site. However, I cannot find where I got it so if anyone recognizes it, please let me know and I'll credit the source. Thanks! Question: I would like to add a craft to one of our Lenten lessons to include Anglican Prayer Beads. I have found some good instruction and ideas on how to make them, but I need some simple prayers for 8 and 9 year old children to recite with their beads. Any ideas? By Hilary Schroeder: Since you are doing this in Lent, find some prayers from devotional books written for kids at their level. Creative Communications for the Parish, Augsburg Fortress and Liturgy Training Publications all produce excellent inexpensive booklets. Or, have kids write their own prayers (if given some pointers/themes). What about taking the Lenten disciplines of prayer, fasting, and alms-giving as topics for prayer. By Tonya: We just made Anglican prayer beads and I made up a handout to give the kids in my classes. By JRzmom: My idea isn't original, and I would be happy to give credit if I could track down the source. We are using prayer pillows as an art project for the children. The pillows are made of infant or children's (size small) t-shirts. Adult volunteers sew the bottom and sides closed on the shirts, including where the sleeve meets the body of the shirt, leaving the neckline open and slipping a piece of cardboard inside to keep the permanent markers from going through. The children choose a prayer or scripture to put on the shirt and then decorate it to their liking with fabric markers. They then remove the cardboard, stuff the pillows and the older children or adult helpers can slip stitch the neck opening closed. T-shirts with pockets would cost a little more, but the pockets can hold prayer cards or small prayer notebooks for the children. Using Fleece - no sewing required! By JCarey: Use fleece to create wonderful pillows with no sewing. The older kids would cut and tie knots, the younger kids would just knot and the youngest could stuff the pillow. Maybe some adults in the church could make the pillows and let the kids decorate with fringe and beads or use paint to place a design on them. I can see the older children saying a prayer for each knot that they make. You would have to sew or iron on with fabric tape a pocket. By Scurlock, AR: In my SS class, I used old pillowcases that I got free from our local thrift store. Before class, I made a template of a large lion paw print (which also happens to be our school mascot). The children traced two or three paw prints anywhere on their cases. Then they took fabric markers and wrote a prayer in each paw print. They chose a good morning, a good night, and the other prayer was whatever they wanted it to be about. (Most chose to write a prayer about world peace.) By using markers instead of paint, the children can take the cases home that day! I do believe they have enjoyed this activity more than any other one we have done. I got this idea from www.christiancrafters.com. This is an absolutely wonderful site to use for SS. I hope this works as well for you all as it did for me!! Moderator Notes: Anyone who has made a prayer pillowcase - have said it worked great! By Hilary: Our kids just made prayer booklets using inexpensive dollar store photo albums. The clear pages allow you to easily change the page as you update prayer requests! One of our clergy uses this method for keeping track of his intercessory prayer list. He has an "emergency" list, one for every day of the week eg. Monday: missionaries, friends abroad, Tuesday: all pastors... (you get the idea). By keywestkel (Kelly): We are creating Lord's prayer books. I have broken the prayer down so that each child adds a page to their Lord's prayer book (on page 1 - "Our Father," on page 2 - "who art in heaven," etc.) I printed labels on the computer with the prayer sentences for the younger kids; older kids can write the portion of the prayer. Then kids illustrate what this portion of the prayer means to them. Creating Lord's Prayer Posters for display among the congregation or use in worship. K & 1st Grade: scrolls, dowels, big paper, fancy letter stencils, skinny markers, markers, crayons, the words of the Lord’s prayer written on the scrolled paper. 2 & 3rd Grades: Big paper or cloth (1/2 a twin sheet works quite well), markers, yardstick to make lines straight, pencils, way to hang the banner. Play a game or do a quick activity to prep the kids for the lesson and to get to know names. For example, have everyone go around and say their name and favorite color. The next person must then tell their name and favorite color and the person’s next to them. Read to them the Lord’s Prayer and explain that this was the prayer that Jesus used to teach others to pray. Tell them that “Our Father” refers to God. “Who art in Heaven” refers to where God is sometimes to watch over us. Help them to learn the first line of the Lord’s Prayer. Decorate the papers that have the Lord’s Prayer printed on it. Explain that this was the prayer that Jesus used to teach others to pray. Some of the 1st graders will want to read. As they read, stop after each line or two and talk about what symbols they could use to illustrate the prayer. Give the kids the scrolls with the words printed on the paper. Have them decorate the scrolls with the pictures which symbolize for them the words. Especially the younger kids may need help figuring out the words and what pictures go where. Remember, though, there is no right/wrong answer! “Read” the Lord’s Prayer together. Last week, the kids wrote a new version of the Lord’s Prayer. You should have that from the “In My Own Words . . . “ teacher. Have the kids talk about why they chose the words they did, and what they mean to them. Have them explain them to the kids who weren’t there. Revisions can be made—as long as people’s feelings aren’t hurt. You may want to have the poster board lightly lined beforehand so the kids can put on the letters. You will want to emphasize that this project will be shown in front of the church (at coffee hour) and should reflect good work, not sloppiness. Find a person with neat writing to line it out, and then someone else can go over the pencil with a marker. Add decorations, whether glued on or drawn on. Close by reading the “new” Lord’s Prayer. These could be used in WORSHIP. If your service uses a projector, photograph the posters and project them during the service where the congregation recites the prayer. "Creating a Prayer Wall" for the congregation. Depending on how many classes you have, you could have each class produce 1 panel during its week in the Art Workshop, thus rolling out the Prayer Wall over a period of weeks. 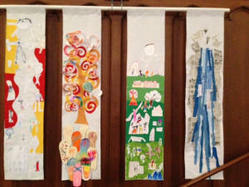 Each week after it is created and put on display, members of the congregation are invited to TACK NOTES to the new Prayer Wall panel. You'll eventually collect a "wall of prayer" which you can leave up for a few weeks, --as others will no doubt want to add to panels when they attend. The panels can be made out of 2' x 4' sheets of drywall. Drywall is easy to paint on with watercolors, quick to dry, and easy to pin notes to. Use colored duct tape to frame the border of the panels. Make a simple stand out of three 2" x 4" x 6* foot uprights and two cross pieces of 2" x 4" x 8' studs. Place the bottom cross piece about 2 feet above the ground so that the panels are within reading distance. You will produce ONE panel PER Week. The new panel will need some time to dry, so you can place the previous week's panel out on display as part of your Art Workshop, and have the students begin to add their A-C-T-S prayers to the panels. • A – Adoration – praise to God – God is awesome, Holy is your name. (Hallowed be Thy name). Ideas for panel: Names of God. • C – Confession – confess what we did wrong, tell what we’re sorry for (Forgive us our trespasses, as we forgive our trespassers). Ideas for panel: Creatively painted 'starter phrases' such as, "I should have..." and "I need to remember to..." and "I need to stop...."
• T – Thanksgiving – give thanks to God, grateful for God’s blessings (thank you for this beautiful day). 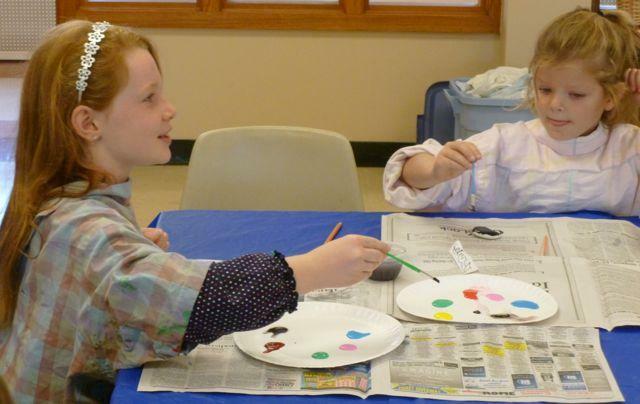 Ideas for panel: Creatively painted pictures of people and things kids are grateful for. • S – Supplication – or asking – asking for help for yourself or others, asking for what we need, (Give us this day our daily bread). Ideas for panel: Creatively painted phrases, such as: "I need..." "Give this person...." "Keep an eye on ...." "In my school/work we need..."
For the bulletin: You are invited to come to our prayer wall in the narthex. Stop & pray with the prayers already hanging there. We encourage you to write your own prayer & tack it to the wall, also. Rotation Sunday School. Suggestion: Pass out Post it Notes during prayer-time in Worship. Have members post their prayers as they leave worship, or collect them and post them for them. 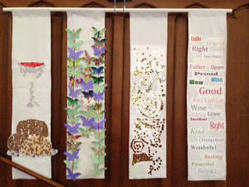 This sermon series inspired eight different banners illustrating the different phrases in the Lord's Prayer.